These allow for the easy removal of scratches on CD-ROMs. 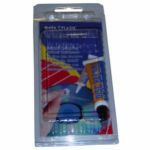 The pack contains a 5g tube of special polishing paste sufficient for approximately 10 - 12 applications. Please note that this product is a polish, and as such can only remove light to medium scratches. As this product does not 'add plastic', deeper scratches may not be able to be polished out completely. Use product sparingly and with caution.